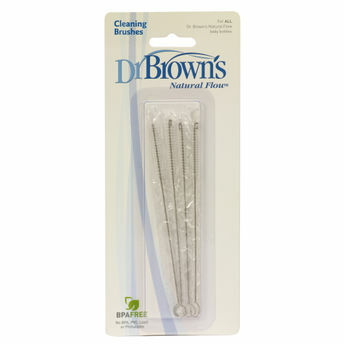 Dr. Brown's Natural Flow Cleaning Brush is a small brush with big cleaning power. It helps to clean and clear blockages of dried milk and formula from Dr. Brown's vent inserts and vent reservoirs so that the patented internal venting system can function seamlessly. These multi-purpose, lightweight brushes easily maneuver through all Dr. Brown's bottle components - especially the Dr. Brown's Internal Vent System - for a fully clean and functioning bottle interior. You can also use them to clean sippy and straw cups. Replace lost or worn brushes with this 4-brush pack or just have a few spares on hand!